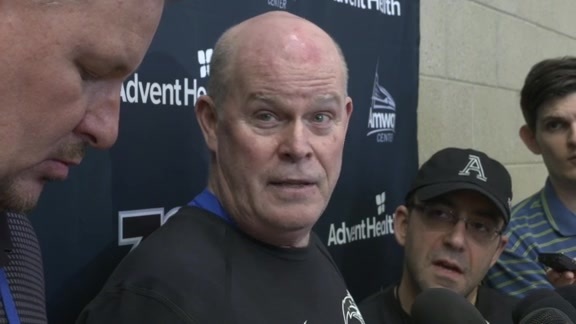 ORLANDO - The addition of Michael Carter-Williams, the NBA Rookie of the Year in 2014 and a point guard Steve Clifford is already very familiar with having coached him in Charlotte, gives the Magic more size and length in their backcourt. Although various injuries, notably one that required him to have hip surgery in 2016, diminished some of his abilities on the offensive end, MCW is still a major force on the defensive side. So much so that many players have struggled scoring against the now-27-year-old the last few years, even though his playing time has been minimal. While with the Hornets last season, the former Syracuse standout and 11th overall draft pick by the 76ers in 2013 limited C.J. McCollum to 2-of-8 shooting when he was his closest defender, per Second Spectrum tracking data. Carter-Williams has very good anticipation, which makes it tough for opponents to elude him off the dribble. Many times players will settle for step-back jumpers against MCW, largely because they know his length could interfere with their shot even if they do happen to sneak in front of him. His length is what really causes problems for opponents, who rarely get clean looks when MCW contests their shots. He has a knack for keeping his arms straight up even as opponents drive on him, allowing him to alter shots near the basket or even swipe the ball away from them. At 6-foot-6, 190 pounds, Carter-Williams moves around the court well, making him a good help defender when he has to switch onto opponents with good size.